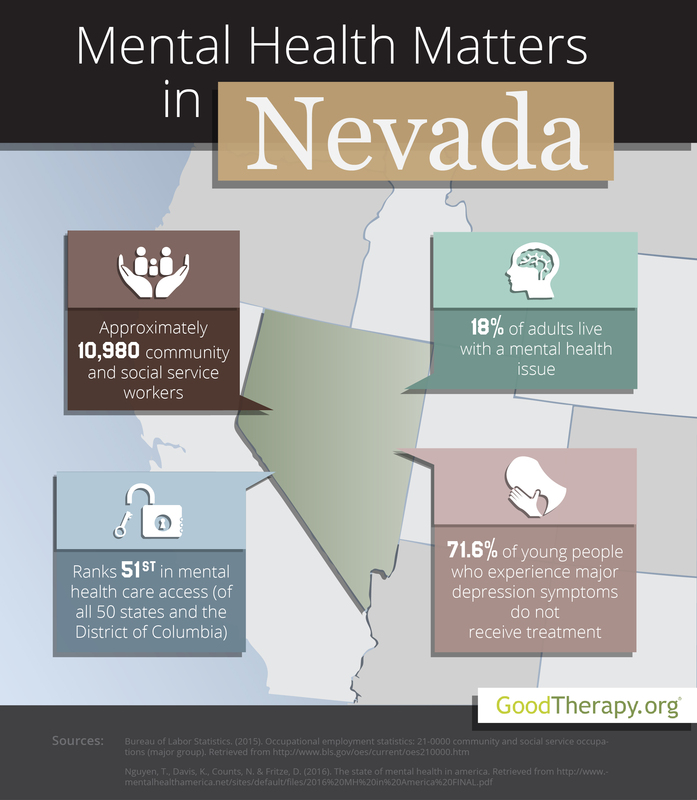 Find a therapist in Nevada with GoodTherapy.org. The United States Census Bureau posits that nearly 2.9 million people were living in Nevada in 2015. Of this combined figure, 76.2% of residents are white, 9.1% are black, 8.3% are Asian, and 1.6% are American Indian and Alaskan Native. Females make up 49.7% of the population. According to information from the Bureau of Labor Statistics, roughly 10,980 Nevada residents were employed in social service and community assistance fields in 2015. Typical occupations within this group included working as psychiatrists, clinical social workers, therapists at depression treatment centers, some categories of corrections officers, counselors at residential treatment centers, health educators, community health workers, mental health nurses, and marriage and family therapists. In Nevada, people who were employed in these and other related professions earned an average of $50,090 each year. Mental Health America (MHA) conducts a nationwide survey each year to evaluate and compare mental health conditions in all states, including the District of Columbia. In the 2016 edition of this survey, the state of Nevada received an overall ranking of 49th for mental health standards. This low placement likely means Nevada has high rates of mental health issues and not enough access to mental health care to accommodate them. Therapists in Nevada and researchers from Mental Health America believe this low ranking correlates with social factors such as low rates of high school graduation for healthy students as well as students with chronic illnesses or disabilities, and high rates of toxic chemical release, violent crime, unemployment, and homelessness in the state. Nevada was listed 49th in adult ranking, 45th in youth ranking, 25th in prevalence of mental health issues, and 51st in ease of access to mental health services. The 2016 MHA survey states 18.4% of adults in Nevada experience mental health concerns. This percentage corresponds to roughly 381,000 people. However, 70.7% of this population did not receive any professional treatment, while 33.4% has no insurance. Nevada was ranked 51st in each of these categories. Data from Mental Health America suggests adults in Nevada are 10 times more likely to be uninsured than adults in Massachusetts. The state was ranked 43rd for adults with a disability who could not obtain treatment due to cost. Young people with mental, emotional, and behavioral concerns may also experience challenges in obtaining needed care. Among adolescents with one or more episodes of depression in the past year, 71.6% did not receive any depression treatment. Among young people with severe depression symptoms, only 9.4% received consistent mental health care. Nevada was ranked 46th and 51st in these respective categories. Researchers from Mental Health America contend Nevada adolescents with severe episodes of major depression are four times less likely to receive outpatient treatment than young people in South Dakota. Nevada was ranked 41st for children with private insurance that did not provide coverage for mental health concerns. Though there are some restrictions when attempting to access mental health care in Nevada, residents with mental health concerns are urged to find a therapist or seek treatment as their circumstances allow. A 2014 report published by the Substance Abuse and Mental Health Services Administration (SAMHSA) states the percentage of teenagers who report improved functioning after receiving treatment from the public mental health care system was higher in Nevada than in the country as a whole—78.8% to 69.3%. Meanwhile, 69% of adults in Nevada report improved functioning after therapy, compared to the 70% average in the U.S.